Over the years, the styles and fashions of engagement rings have changed, frequently. Trends tend to come and go. Because of this frequent change, when a man is shopping for the perfect engagement ring for his future fiancée, he wants to pick a setting that is timeless and she will love for years to come. The split shank engagement ring setting has grown in popularity over the years for just this reason. This type of setting is timeless and has so many positive attributes aside from its gorgeous look. This type of setting is so appealing for couples not only because of its elegance, but also because of its price tag. The average cost of this type of setting ranges anywhere from $500 to over $1,000 for just the setting. While the price is greater than most other types of settings, the consumer is getting more for their dollar amount. These types of settings are commonly paired with pavé-set diamonds on each individual “shank” where the band splits to surround the center stone, adding a beautiful and brilliant touch to any ring. Other styles, while still beautiful, also do not always offer the unique qualities that this setting provides. A consumer is able to create a personalized look with the many way that split shank settings are available. This type of setting also offers a great amount of security for the center stone. Alongside the prongs that set the center stone, the diamond may be surrounded by smaller pavé-set diamonds which provides a more secure setting. Many retailers carry this type of engagement ring setting. Once a consumer has decided to use a split shank engagement ring setting, they can inform their jeweler who can direct them to their selection of these settings. If one does not like any of the available settings, some retailers like Jared’s Galleria will discuss making custom pieces for the future bride. When looking for a setting, one must keep in mind the person in which for they are purchasing it. With so many styles, it is easy to find a setting that will fit the personality of one’s soon-to-be fiancée. In order to ensure that she will love her engagement ring, there are a few things that a consumer should take in to consideration. First, one should look at the other jewelry that she has. What type of feel and look does her other jewelry present? Is there a more vintage look to any of the jewelry? Split shank engagement ring settings work best with round, princess, and cushion cut diamonds because of their simple and traditional shape. These shapes will complement the setting nicely and fit securely in the prongs. Also, and most importantly, one should choose a setting that falls within their budget. For example, purchasing a platinum setting with pavé-set diamonds is going to be much more expensive than a white gold setting. In today’s world, we all know that money can be tight and engagement rings tend to be expensive. There is no reason, however, that a man cannot save on the ring for his future bride and still provide her with the ring of her dreams. There are many ways in one can save on an engagement ring setting. First, one should shop for their split shank engagement ring setting during the holiday season when most jewelry retailers have highly discounted sales on both settings and rings in order to get consumers in the door. Also, if one is looking to save a ton of money at any time of the year, there are many online jewelry retailers that sell their inventory at a 50 percent discount or greater, year-round. This is a great way to receive a significant mark down on the engagement ring setting that one chooses. However, any consumer should remember to get references and make sure that the company they are going to be working with online is recognized by the Better Business Bureau and works professionally with their consumers. 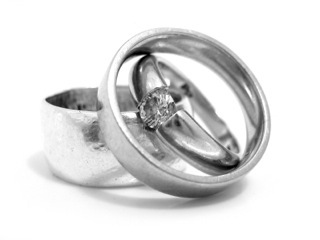 Another great way for one to save money is to give a family heirloom as one’s engagement ring. Many families love to share their special sentiments within the family. If either one’s family or their future bride’s family has a ring with a split shank setting, it may be more cost effective to take the family heirloom to a jeweler and purchase the diamond separately. This creates not only an original piece for one’s fiancée. but also one with a touching story behind it. She will appreciate the thought and care that went in to the creation of her ring. When choosing an engagement ring setting, one is really choosing the style of ring that his fiancée will be wearing for many, many years. This said, one does not want to choose a design that is popular at the moment, but will appear dated in a few years. By purchasing a split shank engagement ring setting, one is creating a piece that will always appear delicate and feminine. This type of setting is not only a cost effective choice, but also a timeless piece that will be adored for many years to come. One must remember when choosing their setting a few simple key ideas in order to buy a setting that will leave their future bride breathless. One must remember to keep their budget and the wishes of one’s fiancée in mind. Also, if one is looking to save money, one should not be afraid to shop around for the perfect ring that really fits all of one’s needs and everything that one feels an engagement ring should be. There are many places that carry split shank engagement ring settings and finding the perfect one can be a challenge. Lastly, one must also remember that when one is purchasing an engagement ring that this is the most special piece of jewelry that one’s fiancée will ever own, so one should take careful consideration about their selection. This is the first step to a long and happy life together and one wants to make sure that the ring setting that they select truly symbolizes that.